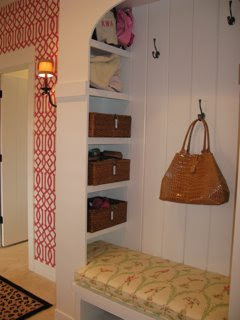 Even mudrooms can be pretty...and dirty. This wallcovering by Kelly Wearstler makes any guest smile and the carpet by Ralph Lauren Floorcoverings hides all the dirt tracked in. The custom built-in has labeled baskets for each family member and hooks for all belongings.